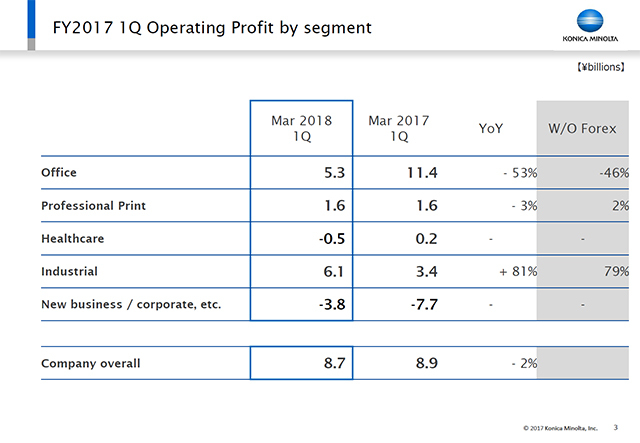 This slide presents a year-on-year comparison of operating profit by segment. Operating profit in the Office Business fell by ¥6.1 billion year on year, but the Industrial Business posted a significant increase in profit. The operating profit ratio exceeded 21%. In addition, due to measures taken to monetize certain assets by means of sale & leaseback, the scale of loss in new business / corporate, etc. was reduced, offsetting the declines in the Office Business.